In Article II, Section 1 of the Constitution of the United States of America , the following requirements are stipulated for those wishing to hold the office of the President of the United States. Source: University of Virginia, Miller Center of Public Affairs, www.millercenter.virginia.edu, August 3, 2007. Born: April 13, 1743, Shadwell plantation, northern portion of Goochland County (now Albemarle County), Virginia. Nickname: "Man of the People," "Sage of Monticello"
President: Two terms (eight years) from 1801-1809. Died: July 4, 1826, Monticello, near Charlottesville, Virginia. Interred: Monticello, near Charlottesville, Virginia. This powerful advocate of liberty was born in 1743 in Albemarle County, Virginia, inheriting from his father, a planter and surveyor, some 5,000 acres of land, and from his mother, a Randolph, high social standing. He studied at the College of William and Mary and then read law. In 1772 he married Martha Wayles Skelton, a widow, and took her to live in his partly constructed mountaintop home, Monticello. Source: www.WhiteHouse.gov, August 5, 2007. 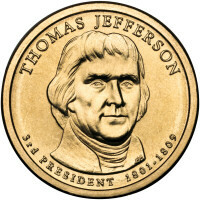 During his first term as President, Thomas Jefferson virtually doubled the size of the United States when his Administration successfully completed the Louisiana Purchase in 1803 and commissioned the Lewis & Clark Expedition to explore the new territory. The United States Mint's recent Westward Journey Nickel Series marked the bicentennial of these important events. Act of March 3, 1803: This Act continues, in force, the Act of March 3, 1801, directing the location of the United States Mint to remain in Philadelphia for another five years. Act of April 10, 1806: This Act authorizes certain gold and silver coinage from Great Britain, France, Portugal, and Spain and its dominions as legal tender for the payment of all debts within the United States. Values are assigned to these certain coins and the Secretary of the Treasury is charged with the responsibility to "cause assays of the foreign gold and silver coins made current by this act" at least once a year. Act of April 21, 1806: This Act establishes penalties for counterfeiting both foreign and domestic coins to be between three and ten years hard labor. Act of April 1, 1808: This Act continues to fix the location of the United States Mint in Philadelphia for five more years. 1806: Robert Patterson, Fourth Director of the United States Mint. Source: www.USMint.gov, August 5, 2007. Monticello Thomas Jefferson Wiki Trustworthy information on Thomas Jefferson and his world by Monticello researchers and respected Jefferson scholars. Thomas Jefferson (Library of Congress Exhibition) This exhibition focuses on the extraordinary legacy of Thomas Jefferson--founding father, farmer, architect, inventor, slaveholder, book collector, scholar, diplomat, and the third president of the United States. Thomas Jefferson America's Story from America's Library , the Library of Congress. American Presidents: Life Portraits A Site to Complement C-SPAN's 20th Anniversary Television Series, American Presidents: Life Portraits . Thomas Jefferson (1801-1809) American President: An Online Reference Resource from the Miller Center of Public Affairs, University of Virginia. In-depth information reviewed by prominent scholars on each President and administration. Thomas Jefferson This PBS site explores the storied and controversial life of Thomas Jefferson through photo essays, background information, and classroom activities. Companion site for Ken Burn's film, Thomas Jefferson . Thomas Jefferson Companion site for Public Broadcasting's American Experience: The Presidents . Thomas Jefferson Thomas Jefferson from Wikipedia, the free encyclopedia. Thomas Jefferson: Third President The American Presidency: A Glorious Burden : Objects from the Presidency from the Smithsonian National Museum of American History, Behring Center. The Thomas Jefferson Papers 1606-1827 The complete Thomas Jefferson Papers from the Manuscript Division at the Library of Congress consists of approximately 27,000 documents. 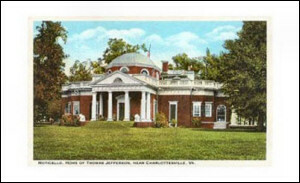 Thomas Jefferson Digital Archive Electronic Text Center from the University of Virginia Library. Thomas Jefferson's Monticello Monticello is the autobiographical masterpiece of Thomas Jefferson, designed and redesigned and built and rebuilt for more than forty years. Explore the house, gardens, and plantation of Monticello, the mountaintop home of Thomas Jefferson, third president of the United States and author of the Declaration of Independence. Jefferson and His Time , by Dumas Malone, 6 volumes, University of Virginia Press (June 30, 2005). Dumas Malone's classic biography Jefferson and His Time - originally published in six volumes over a period of thirty-four years, between 1948 and 1982 - was awarded the Pulitzer Prize in history and became the standard work on Jefferson's life. The University of Virginia Press is pleased to announce that the complete, illustrated six-volume biography is available for the first time in a handsome boxed set. Merrill Peterson, editor of the Library of America edition of Thomas Jefferson's writings, has contributed a new foreword to the Virginia edition. Thomas Jefferson and the New Nation , by Merrill Peterson, 1,104 pages, Oxford University Press, USA; New Ed edition (September 11, 1986) The definitive life of Jefferson in one volume, this biography relates Jefferson's private life and thought to his prominent public position and reveals the rich complexity of his development. As Peterson explores the dominant themes guiding Jefferson's career -- democracy, nationality, and enlightenment -- and Jefferson's powerful role in shaping America, he simultaneously tells the story of nation coming into being. The Pursuit of Reason: The Life of Thomas Jefferson , by Noble E. Cunningham, 414 pages, Ballantine Books (May 12, 1988) The authoritative single-volume biography of Thomas Jefferson, perhaps the most significant figure in American history. He was a complex and compelling man: a fervent advocate of democracy who enjoyed the life of a southern aristocrat and owned slaves, a revolutionary who became president, a believer in states' rights who did much to further the power of the federal government. Drawing on the recent explosion of Jeffersonian scholarship and fresh readings of original sources, In Pursuit of Reason is a monument to Jefferson that will endure for generations. 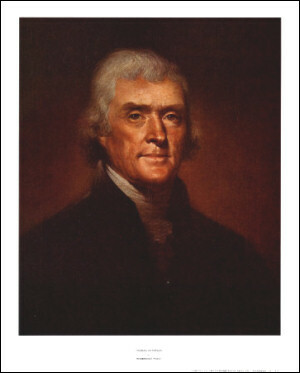 American Sphinx: The Character of Thomas Jefferson , by Joseph J. Ellis, 464 pages, Vintage (April 7, 1998) For a man who insisted that life on the public stage was not what he had in mind, Thomas Jefferson certainly spent a great deal of time in the spotlight--and not only during his active political career. After 1809, his longed-for retirement was compromised by a steady stream of guests and tourists who made of his estate at Monticello a virtual hotel, as well as by more than one thousand letters per year, most from strangers, which he insisted on answering personally. Thomas Jefferson , by R. B. Bernstein, 288 pages, Oxford University Press, USA (July 27, 2005) In Thomas Jefferson , Bernstein offers the definitive short biography of this revered American -- the first concise life in six decades. Bernstein deftly synthesizes the massive scholarship on his subject into a swift, insightful, evenhanded account. More Thomas Jefferson books from Amazon.com. Thomas Jefferson on DVD from Amazon.com.